Little Wilson Stream's upper falls is a scenic landmark in Maine's '100-Mile Wilderness' (the most remote section of the Appalachian Trail). It is in Elliotsville Plantation, six miles northwest of Monson, off Elliotsville Road. To get there from Monson, drive to the Elliotsville Road bridge that crosses Big Wilson Stream, turn left on a logging road immediately before the bridge. Drive about a mile north (along Big Wilson Steam's east bank) to a clearing (and old campground) at Lower Little Wilson Falls. The lower falls has a beautiful flume and a deep swimming hole with a rope swing. These are worth visiting by themselves, but if you're up for a half-hour hike, the upper falls is well worth the effort. Follow the footpath on the south bank of Little Wilson Stream, which starts at the lower falls. This path is a spur to the Appalachian Trail, and you'll join up with the AT three-quarters of the way to the upper falls. The upper falls has a drop of about 60-80 feet. It rivals Moxie Falls (near the Forks) in height. Its most interesting feature is the moss-covered slate on the north wall of the gorge. Very primordial! The upper falls is very difficult to photograph, unless you ford the stream above the falls and bushwhack to spot on the north rim. The south rim has the most accessible view, but you can't capture the whole drop even with a good wide lens. The photo is of only the tippy-top of the falls, from the south rim. 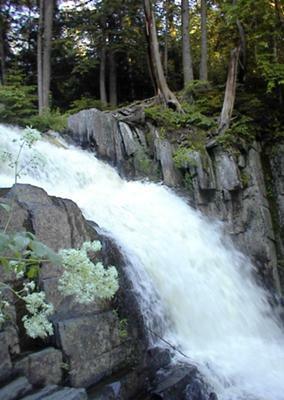 Although Roxanne Quimby does own the lower Little Wilson Falls property, including the former campground, access road and trail to the upper falls, the road is no longer blocked to vehicular traffic. Piscataquis County determined that the access road is a public right-of-way and the gate was subsequently removed. Even if the gate is ever re-installed, it has always been Roxanne's intention to keep the property open to hikers. Her purchase of the property was intended to protect the acreage for conservation purposes and for limited public access and use. Roxanne is not a villain; she is merely a purest when it comes to how the Maine wilderness should be used and shared. She prohibits fishing, hunting, kindling campfires and the use of motorized traffic on her land holdings, but welcomes hikers. Roxanne Quimby is taking our right to visit this beautiful place away from us, you are now greeted with a gate to block access.